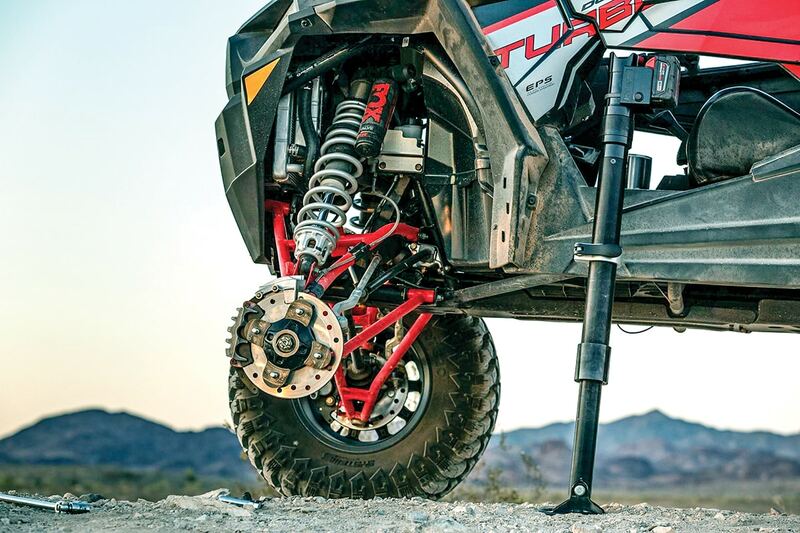 Carrying a spare tire is one of our top tips to any new off-roader; however, a spare is useless if you don’t have the tools to change the tire. That means you need the proper-sized wrench and a jack to lift the vehicle off the ground. We have put together a healthy list of all the options you have to carry a jack with you on the trail. We have also included a few that will work at home or back at camp too. Worth knowing: This is your lowest cost option other than borrowing the bottle jack out of your pick up to carry along. Place the scissor jack directly under your A-arms and trailing arm and your tire will be off the ground in seconds. 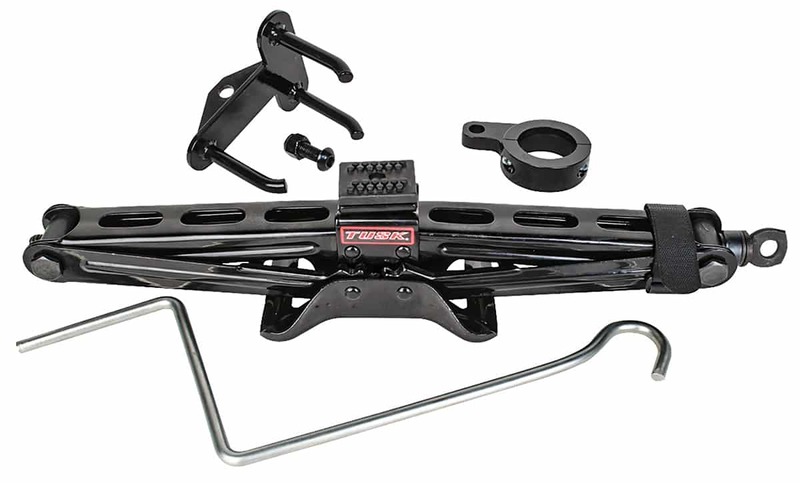 Tusk has roll-bar mounting kits to keep the complete package priced better than anything. Worth knowing: This jack has the ability to lift, hoist or spread like any farm or High Lift jack. It’s made with heavy-duty steel and will probably outlast your current ride. Quad Boss has mounts for your UTV ($64.99) and a rubber Handle keeper ( $14.99) that will keep it from rattling. 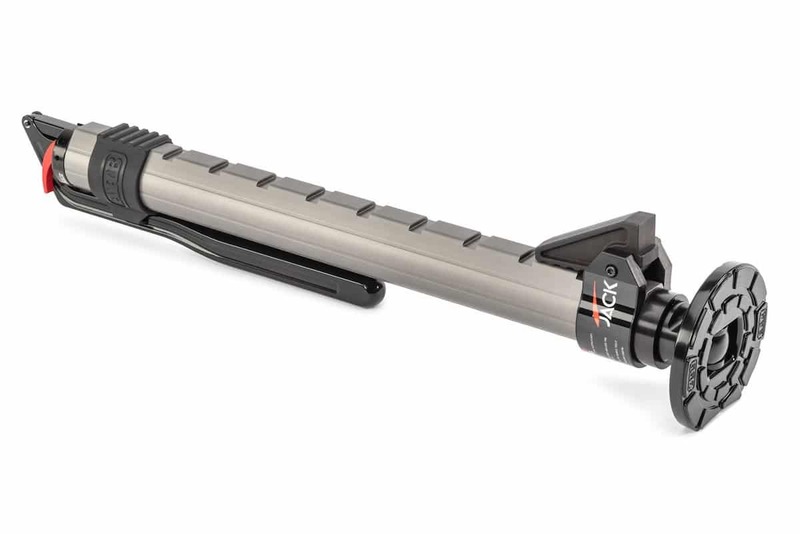 Worth knowing: The JackDaddy is a 6.4-pound lightweight and compact universal jack that connects to your lower shock bolt. It uses a pendulum motion to safely load the suspension and compress the shock. It keeps the tire low to the ground for quick and efficient repairs. 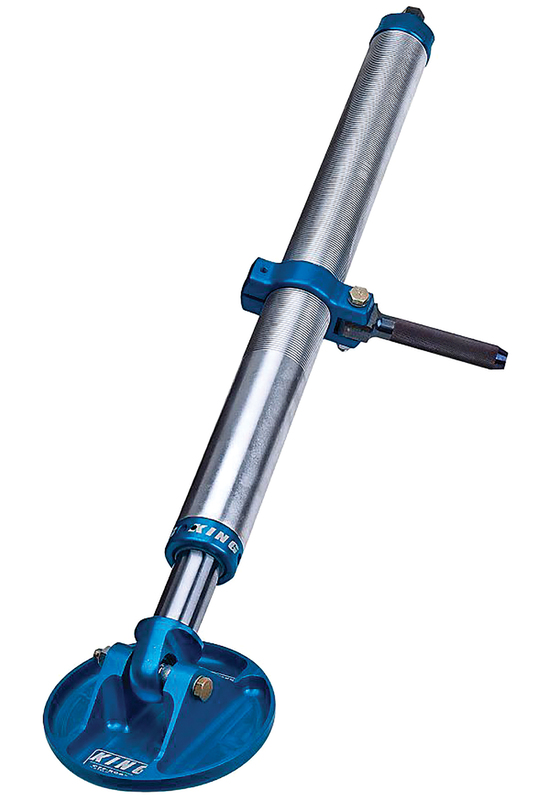 Worth knowing: This screw jack has a 2000-pound capacity and can lift nearly 3 feet. 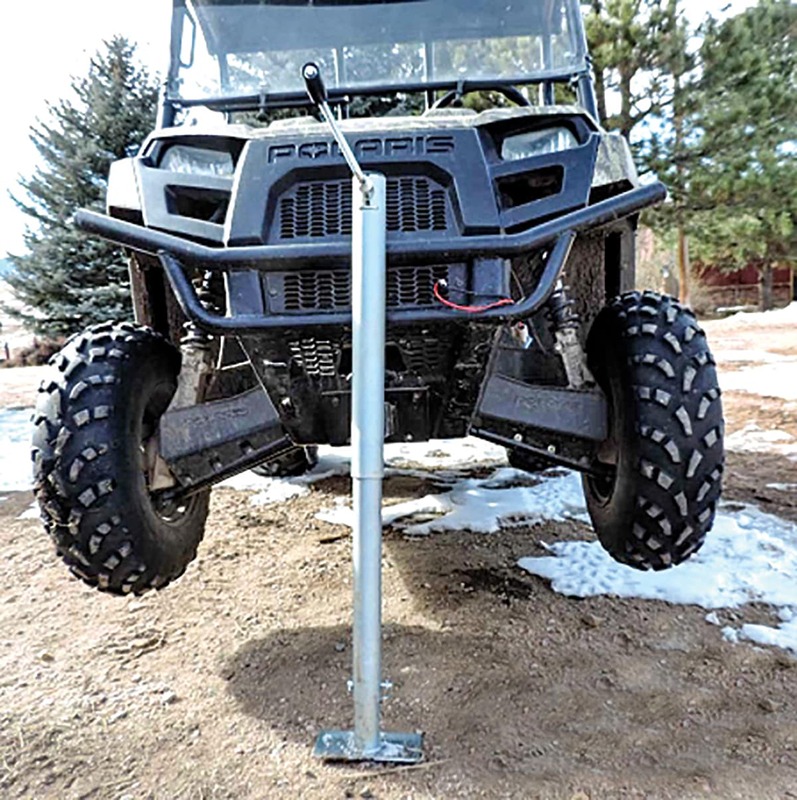 It weighs 13 pounds and uses a 6-inch-long lift tongue to reach under any A-arm, trailing arm, bumper or frame section. It operates with a cordless impact gun or hand crank. 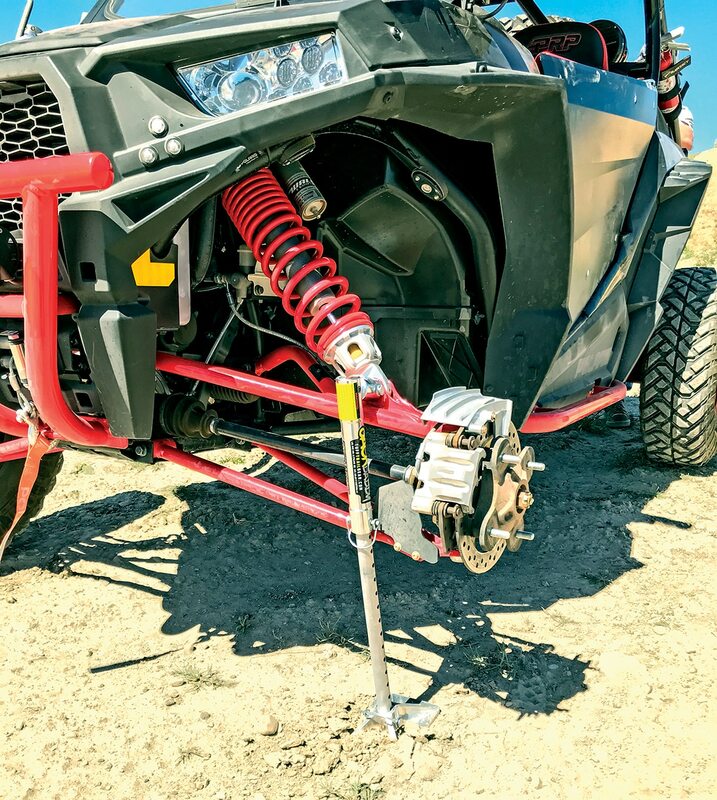 Worth knowing: This is a standard scissor jack with a custom mount to fit perfectly on a Polaris RZR XP on either the driver or passenger side. The jack secures to that with an aluminum quick-disconnect pin. If you decide to weld a 19mm nut to the end of the jack, you can use an impact wrench; or, if you prefer the manual method, handles are included to raise and lower the jack. Worth knowing: At Chaparral, Pro Armor’s QuickShot is listed as being available for Can-Am machines only; however, the jack platform and tire straps can fit any tire for any brand machine. You basically strap it to wherever you have your spare tire mounted. It’s a scissor jack and platform that won’t sink in soft sand or mud. The QuickShot comes with a 17mm tire iron, and you can add clamps for shovels or flashlights too. It’s one of the handiest products we have seen. Worth knowing: The original HighLift or “farm jack” works well to lift any off road vehicle; however, it is heavy. AGM sells the standard model or an upgraded kit to turn any HighLift into a more manageable system weighing half as much. The aluminum center section and handle are available in red, raw, blue or black and weigh only 16 pounds. Worth knowing: The 19-pound F-O-A Race Jack will lift height in mere seconds using your 1/2-inch cordless impact driver end, which goes directly into the top of the jack—no special sockets required. Slip the lift pin into your previously installed 1/2-inch ID lift point, and your vehicle is off the ground in seconds. 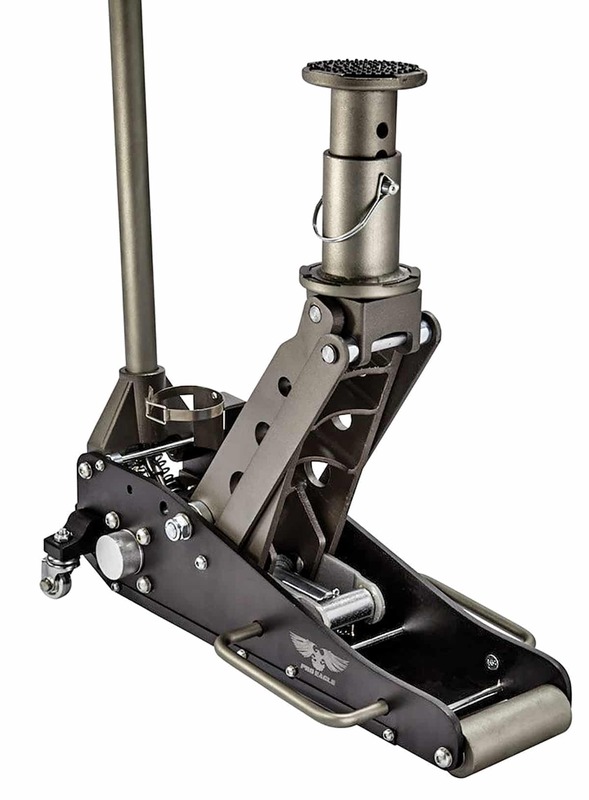 A large billet foot ensures stability and can support over 2500 pounds. 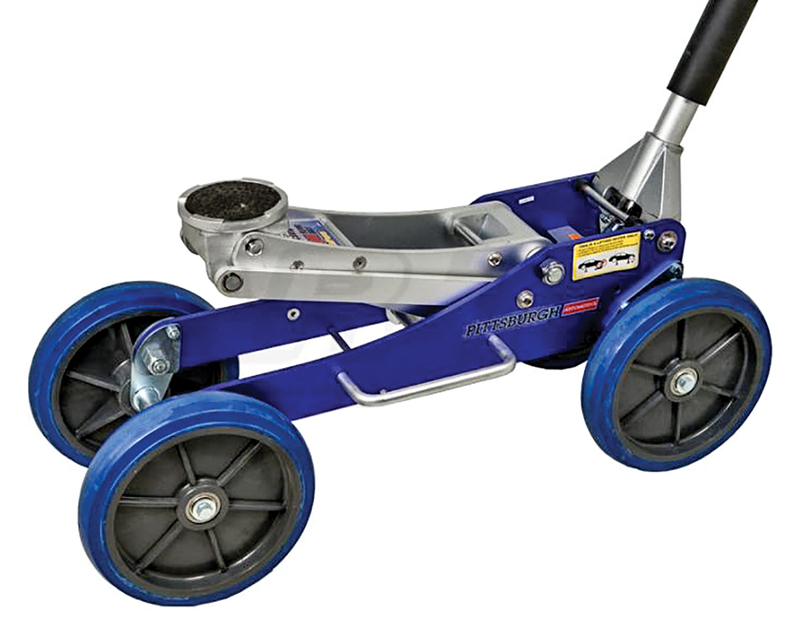 Worth knowing: The Big Wheel kit allows a Harbor Freight’s Pittsburgh Automotive brand aluminum 2-ton jack to be easily rolled under a UTV on hard pack and soft dirt. The tall wheels also raise the overall height of the jack to reduce the need for jack blocks for long-travel cars. The kit simply bolts on to the jack without needing any fabrication work. Jack not included. Worth knowing: The Electric jack makes easy work of any lift with its single-button operation and on-the-fly, quick-release height adjustment. It’s powered with a single Milwaukee drill battery (not included). Worth knowing: The King screw jack is a mechanical design that does not rely on hydraulic fluid to lift your vehicle and has a weight capacity of up to 3800 pounds. The screw actuating nut is a 3/4-inch hex made to use with your cordless impact. 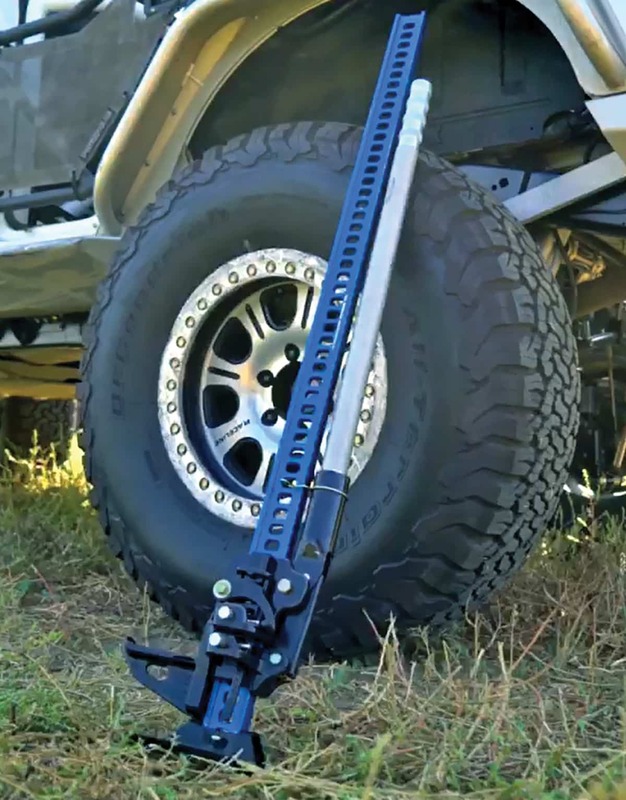 The jacking boss is adjustable up and down on the jack body to compensate for the height of any UTV. Worth knowing: Simply preset the adjustable jacking platform to the proper position for your vehicle. In most cases, no more than four pumps are required to raise it enough to remove a tire. When fully collapsed, the overall length is a compact 37 inches, allowing you to stow the 13-pound Hydra-Jac easily. Worth knowing: This screw jack is designed for the Maverick X3 but can be used on any machine. It takes a 1/2 drive impact to raise the lift bar under any A-arm, trailing arm, bumper or frame section. The support base will integrate into Can-Am’s spare tire carriers. Worth Knowing: The 6061 T6 aluminum body has 9 mounting locations for the adjustable hook and only weighs 23 pounds. 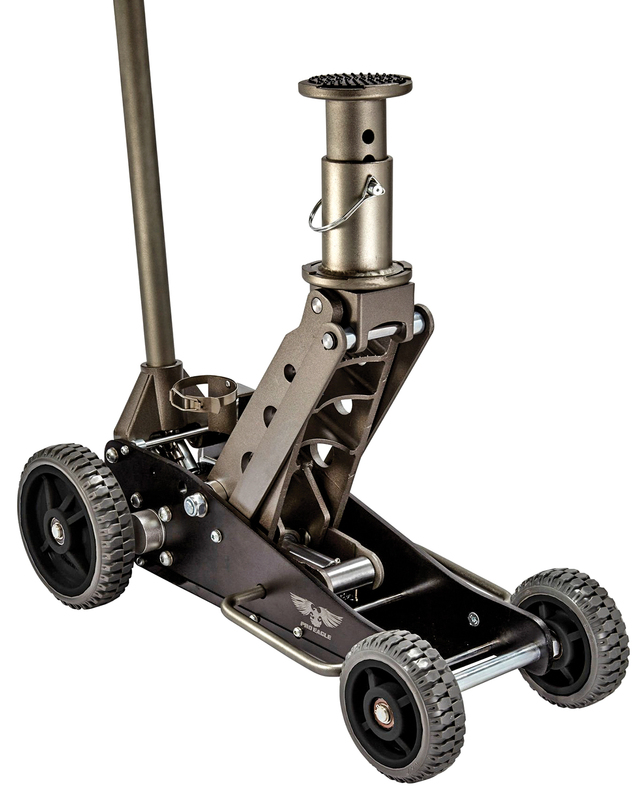 For a secure lifting platform, the Jack’s foot can be rotated 360° to match any terrain and will lift 4,409 pounds. The Jack’s built-in rubber bumper protects your frame from scuffs and scratches. 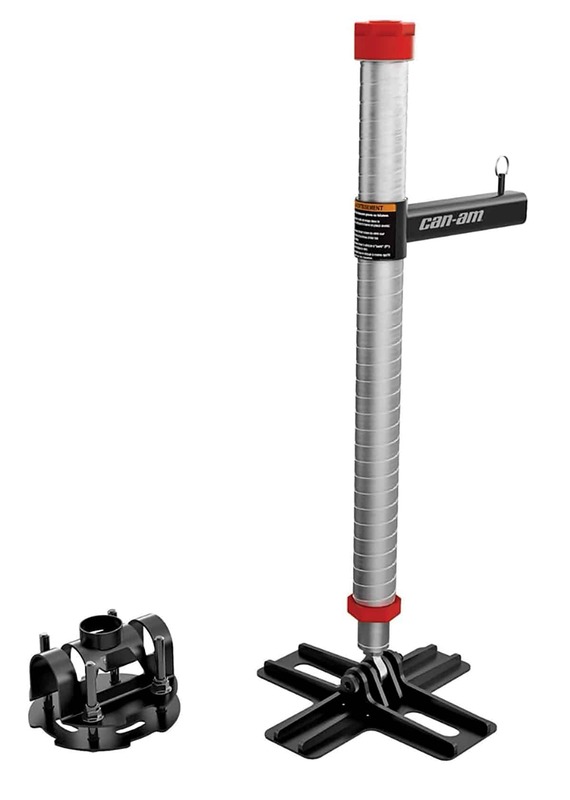 Worth knowing: Pro Eagle designed the standard 2-ton jack to lift long travel cars on hard surfaces. It has hardened wheels that won’t scratch your garage floor. Also included is the adjustable extension to give you added lift height. The extension locks into the included cradle when not in use. 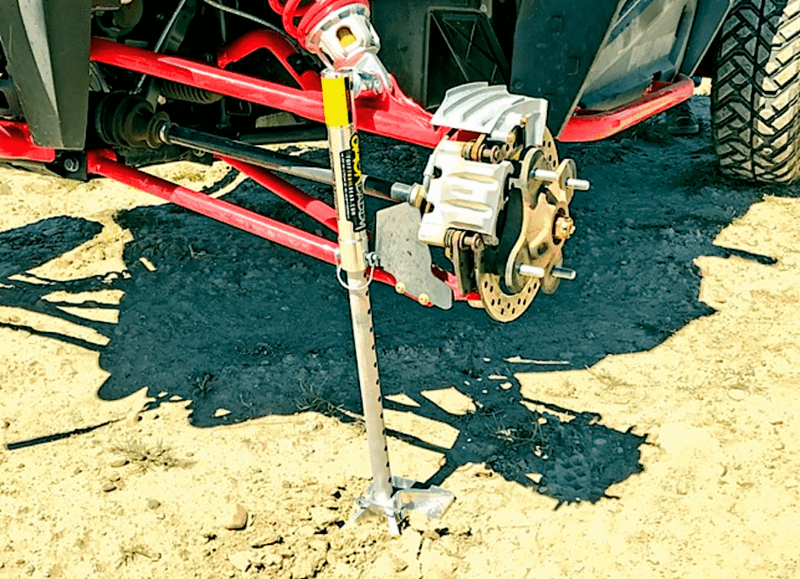 Worth knowing: Pro Eagle designed the 2-ton off road jack to be just as useful on the trail as it is in the garage. The built-in sand plate gives flotation on sand, mud and loose gravel but does not interfere with the wheels, allowing it to roll on solid ground. Also included is the adjustable extension to give you added lift height. The extension locks into the included cradle when not in use.